NextGen Player - Canada's Premier Entertainment Blog: Be like...Snake? With the recent and highly anticipated launch of Metal Gear Solid 4 (a game that I've been waiting years for), comes a very cool accessory from 3rd party game accessory manufacturer Pelican. Introducing the Metal Gear Solid 4 Headset. Now I have to say that this is probably one of the sweetest gaming accessories that I've seen. It looks like an actual headset that the legendary hero Snake would use during combat. With a design and style straight out of the game itself this bluetooth v2.0 headset has a built in Li-Polymer battery which Pelican lists with 8 hours talk time and 160 hours stand-by time. Other features include auto power off and 30 feet of operational range. 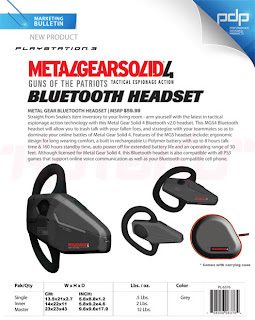 Also, by no means is this headset exclusive to use with MGS4 as it works with all other PS3 games that support headset functionality. Cost for this headset is approx. $60 which seems reasonable and can be purchased at game retailers now. I will likely be dishing out my hard earned cash for this gadget. So...the question remains, where can I get Snake's tactical suit with the camo feature?? ?